Jess Birdwell, a Quaker with a fondness for fast horses, his wife Eliza, and their children struggle to deal with the turmoil, violence, and challenges of the Civil War in their own way. Reprint. 12,500 first printing. A quintessential American heroine, Eliza Birdwell is a wonderful blend of would-be austerity, practicality, and gentle humor when it comes to keeping her faith and caring for her family and community. Her husband, Jess, shares Eliza's love of people and peaceful ways but, unlike Eliza, also displays a fondness for a fast horse and a lively tune. With their children, they must negotiate their way through a world that constantly confronts them-sometimes with candor, sometimes with violence-and tests the strength of their beliefs. Whether it's a gift parcel arriving on their doorstep or Confederate soldiers approaching their land, the Birdwells embrace life with emotion, conviction, and a love for one another that seems to conquer all. The Friendly Persuasion has charmed generations of readers as one of our classic tales of the American Midwest. from Buccaneer Books (August 30, 2005); titled "Friendly Persuasion"
Reprint edition from Amereon Ltd (December 1, 1982); titled "Friendly Persuasion"
About: A Quaker's fondness for fast horses is an amusing sidelight in this tale of Friends who dealt with the Civil War in their own way. 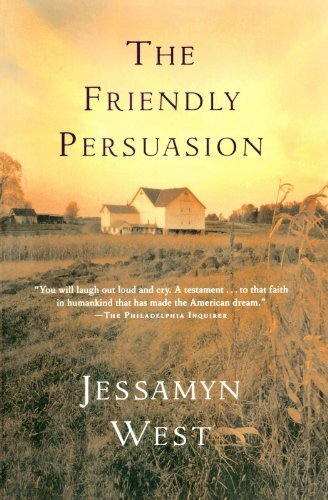 from Houghton Mifflin (September 1, 2003); titled "Friendly Persuasion"
About: Jess Birdwell, a Quaker with a fondness for fast horses, his wife Eliza, and their children struggle to deal with the turmoil, violence, and challenges of the Civil War in their own way. About: A quintessential American heroine, Eliza Birdwell is a wonderful blend of would-be austerity, practicality, and gentle humor when it comes to keeping her faith and caring for her family and community. Reprint edition from Demco Media (July 1, 1991); titled "Friendly Persuasion"